Selective electrostatic eradication of Sitophilus oryzae nesting in stored rice. Citation: Matsuda Y, Takikawa Y, Nonomura T, et al. Selective electrostatic eradication of Sitophilus oryzae nesting in stored rice. J Food Technol Pres 2018;2(1):15-20. We devised a simple electrostatic apparatus to selectively kill nesting rice weevils (Sitophilus oryzae), the most destructive pests of stored grains, seeds, and grain products. The apparatus consisted of two parallel stainless steel nets and external insulator boards. One net (CN) was linked to a direct-current voltage generator to supply a negative charge; the other net (EN) was linked to a grounded line. The negative charge on the CN positively polarized the EN through electrostatic induction, forming an electric field between the nets. Electrostatic discharge from the CN depended on the distance between the nets (pole distance) and the voltage applied to the CN. Adult rice weevils were introduced into the electric field between the nets, which were charged to the maximum voltages possible without triggering electric discharge in the CN. Once the insects were introduced, they were subjected to instantaneous and transient electric current by an arc discharge from the CN, and violently ejected from the electric field. These insects were electrocuted, and the number of dismembered insects increased as the applied voltage increased. This exterminatory effect was similarly detected when a mixture of rice grains and insect pests was introduced into the electric field. Pests were selectively electrocuted within the apparatus due to the high conductivity of the insect cuticle and the insulative properties of rice grains. The proposed system is simple and easy to construct, and its scale can be enlarged through the use of larger nets, corresponding to the volume of rice grains. Thus, the present study provides an experimental basis for the practical application of an electrostatics-based pest control method. Electric discharge, Electric field, Pest control, Stored grain pest. The most serious problem in the storage of harvested rice is infestation by the rice weevil (Sitophilus oryzae), which is the most destructive pest of grains, seeds, and grain products stored in elevators and bins . Adult rice weevils live for 4-5 months and each female lays 300-400 eggs during this period. The female uses her strong mandibles to chew a hole in the grain kernel where she deposits a single egg and seals the hole with a gelatinous fluid. Larvae develop within the grain kernels as they eat and frequently cause almost complete grain destruction in storage facilities. The rice weevil is insidious, because adults disperse by flight, allowing infestations to spread to neighboring areas. Prevention of entry is the best strategy to avoid insect infestations in stored grains , and proper sanitation before the introduction of new grain is essential to minimize the risk of insect contamination of the new grain. New grain should therefore be screened to eliminate fine materials and broken kernels before storage in a bin, and stored grain should be checked at regular intervals. Despite these precautions, however, infestation occurs frequently in many storage facilities, and eventual fumigation of the grain is inevitable. Nevertheless, fumigation is difficult and costly due to the high toxicity of registered fumigants and the technical knowledge required for their proper use . To solve this problem and to develop a safe and economic pest control method, we constructed a new electrostatic device to selectively eradicate rice weevils nesting in rice grain. Applied electrostatics has been the academic and technical basis for developing various practical instruments for the successful management of pathogens and insect pests in agricultural crops during various stages of crop production and preservation. The ways in which electrostatic principles have been applied are diverse: capturing spores and insects using the attractive force generated in a static electric field (without electric discharge) [3-7], repelling insects by their aversion to the electric field [3,8,9], disinfecting bacterial and fungal pathogens by ozone produced through streamer discharge , and instantaneously dislodging fungal pathogens from plants through exposure to a plasma stream produced through a corona discharge in the electric field . Based on these successful applications, we propose a new electrostatic apparatus to kill insect pests with high-energy electrons produced within an electric field. The main purpose of our research program was to present a practical apparatus with a simple structure that can be constructed easily and cheaply, and which functions according to electrostatic principles. Our apparatus consisted of a pair of electrostatically charged stainless steel plates. We hypothesized that, due to the high conductivity of the insect body, only insects would be electrocuted by arc discharge instantaneously generated within the apparatus. We tested the apparatus on insects and a combination of insects and grains, to determine its effectiveness, and then optimized its configuration by determining the most appropriate pole distance and applied voltage. Larvae of the rice weevil (S. oryzae) were obtained from stock cultures in the laboratory of Earth Environmental Service (Osaka, Japan) and incubated to eclosion in a growth chamber at 25 ± 2°C and 60 ± 5% relative humidity (RH). Adult rice weevils were collected using an insect aspirator (Wildlife Supply, NY, USA) and reared on rice grains in plastic containers (diameter: 20 cm; height: 10 cm) under the same conditions. The average body size of the adult rice weevil (i.e., mean length from head to wing tip in 20 adults) was 2.56 ± 0.28 mm. The structure of the apparatus is shown in Figure 1A. Two identical stainless steel nets (4 mm mesh) were arranged in parallel with 10 mm spacing between nets to create opposite poles. One net (CN) was connected to a direct-current voltage generator (Max-Electronics, Tokyo, Japan) and negatively charged with different voltages, and another net (EN) was linked to a grounded line. Polypropylene slips (insulators) (10 mm thick) were placed between the nets as spacers to maintain the distance between electrodes (pole distance). The negative surface charge on the CN caused an electrostatic induction in the EN, creating an opposite surface charge on the CN-side surface of the EN. An electric field formed between these opposite charges on CN and EN (Figure 1B). The transfer of free electrons from the CN side to the EN-side ground was measured using two galvanometers PC7000 (Sanwa Electric Instrument, Tokyo, Japan) integrated into the grounded lines. The outside of the apparatus was covered with a polypropylene insulator to prevent rice grains from leaking through the mesh or from the side edges. Three types of the apparatus with different net sizes were constructed: 20 × 45 cm (small or Stype), 80 × 45 cm (mid-sized or M-type), and 160 × 45 cm (large or L-type). Figure 1: Diagram of the electrostatic apparatus for selectively shooting rice weevils with accelerated electrons in an electric field. (A) Two stainless steel nets were arranged in parallel at a defined interval to create an electric field between them. One net (CN) was linked to a voltage generator to supply negative charge; the other net (EN) was linked to a grounded line. (B) Cross-sectional view of electric field formed between CN and EN. The negative charge on CN positively polarized EN through electrostatic induction, forming an electric field. Solid and dashed arrows show the direction of electron movement and the paths taken by insects and rice grains, respectively. In the first experiment, the three types of the apparatus were negatively charged with 1-12 kV to produce a mechanical discharge (arc discharge) from the CN projection point. In addition, a silent discharge , which was constantly generated from the EN-side surface of the CN, was measured in the voltage range (1-10 kV), causing no mechanical discharge. The electric current was estimated as the sum of the silent and mechanical discharges or as the insect-mediated discharge (see text below) with a built-in galvanometer. Experiments were conducted at 25°C and under different relative humidity (RH) conditions (40, 60, and 80%). In the second experiment, the three types of the apparatus were negatively charged with different voltages (1-10 kV) to determine the range of voltages that caused electrocution in all insects introduced into the screen and the magnitude of the insect-mediated transient electric current (caused by arc discharge) at given voltages. Adult rice weevils were collected with an insect aspirator and blown between the nets by passing compressed air through the tip of an insect aspirator. All experiments were conducted under the RH and temperature conditions noted above. The insect-mediated discharge was recorded by the built-in galvanometer as a transient electric current. After the insects had passed through the electric field, their mortality and dismemberment were evaluated. We used 20 adults for each voltage and RH condition tested. We then mixed adult rice weevils with rice grains (10, 50, and 100 insects per 100 g of rice grains) and introduced this mixture between the nets of the apparatus to determine the ratio of dead and dismembered insects. These insect discharge assays were conducted in a room maintained at 25°C and 60% RH. The experiments were performed in triplicate; data are presented as means and standard deviations (SD). Significant differences between treatments were determined using Tukey’s method. In the third experiment, the practicality of the present method was examined using L-screen for practical scale, charged with 9 kV using the same voltage generator. Grains of pest-infested rice in a bag were introduced into the apparatus. Prior to introduction into the apparatus, we counted the insects in the bag to precisely evaluate the effectiveness of pest eradication by the proposed approach. In this study, we formed an electric circuit in which the electricity (free electrons) moved from ground to ground (Figure 1B). High voltages produced through a Cockcroft circuit  in the voltage generator were used to electrify both electrodes by adding electricity to the CN and discharging electricity from the EN. The flow (electric current) of the accumulated electricity on the CN depends on the voltage applied to the electrode, the electrode distance (pole distance), and the air conductivity between both electrodes. The current was proportional to increases in voltage and inversely proportional to increases in distance. Air conductivity changes in response to changes in water-vapor concentration in the air; the air conductivity becomes higher (i.e., higher electrical transfer) as RH becomes higher . In the present study, the pole distance was fixed, and the voltage was changed to effectively electrocute the rice weevils with the electrostatic device under different RH conditions. In the first experiment, we determined the voltage that would cause a mechanical discharge from the CN due to the nonuniform structure of the nets used for the present apparatus. The projection point on the CN generated the mechanical discharge (arc discharge). As the voltage applied to the CN was increased, the apparatus eventually caused a mechanical discharge at>10 kV regardless of changes in RH. This result implied that at ≤ 10 kV, the apparatus could be operated without causing a mechanical discharge, even with changes in RH. The electrostatic device was configured so that two noninsulated conductor nets faced each other to produce an electric field. In this electric field, a silent discharge constantly occurred from the EN-side surface of the CN to the EN. Figure 2 shows the relationship between the applied voltage and the generation of the silent discharge. In all types of the apparatus, the electric current produced by this discharge became greater in direct proportion to increases in the applied voltage in the range of 4-10 kV (S-type), 3-10 kV (M-type), and 1-10 kV (Ltype). 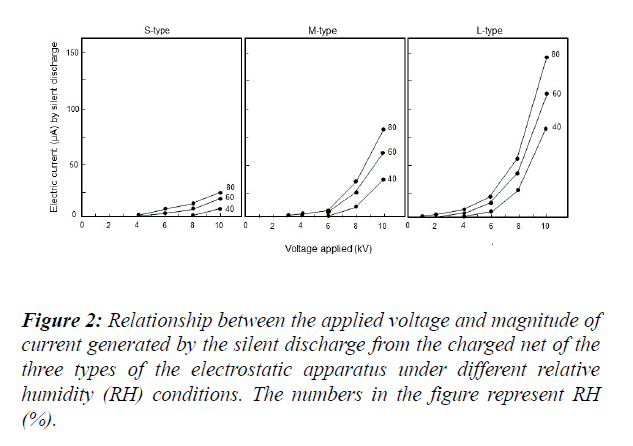 Figure 2: Relationship between the applied voltage and magnitude of current generated by the silent discharge from the charged net of the three types of the electrostatic apparatus under different relative humidity (RH) conditions. The numbers in the figure represent RH (%). The electric current was greater as the net size of the apparatus increased. Furthermore, the electric current became greater with increased RH for all types tested. Measurements with an ion detector showed that the present electrostatic apparatus ionized the air in the electric field with ozone generation (data not shown). The ionized air in the electric field was extremely active and could destroy or inactivate various microorganisms, including viruses . This ability of the apparatus may be a useful additional feature to sanitize the inside space of the apparatus. In the subsequent experiment, we applied various voltages that did not cause a mechanical discharge from the CN, and we introduced a conductor, which transmits electricity (free electrons) according to its capacity , into the space between the nets. Our hypothesis was that this conductor material could act as a temporary recipient of electrons from CN and as a donor of electrons to EN, due to the shorter distances to the poles. Insects were suitable bio-conductors for this purpose (Figure 3). 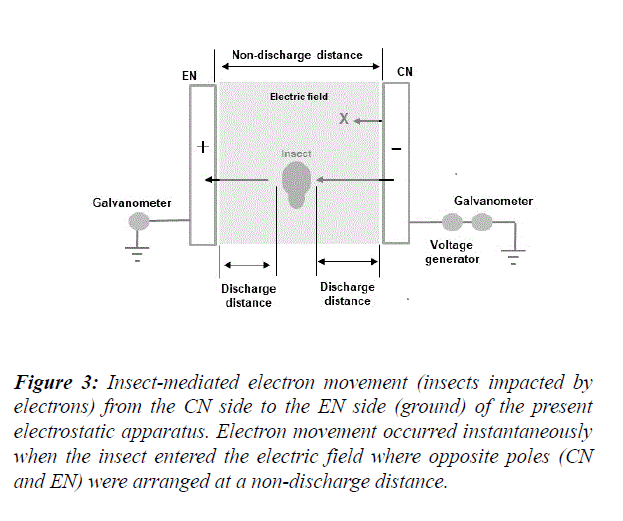 Figure 3: Insect-mediated electron movement (insects impacted by electrons) from the CN side to the EN side (ground) of the present electrostatic apparatus. Electron movement occurred instantaneously when the insect entered the electric field where opposite poles (CN and EN) were arranged at a non-discharge distance. Many previous studies [16-21] have reported that the cuticle, an outer protective layer that covers the bodies of many invertebrates, is efficiently electrified due to its high conductivity. Adult rice weevils also develop this cuticle structure . In this experiment, we conducted an assay to determine the validity of this hypothesis. Table 1 lists the magnitude of the instantaneous transient electric current mediated by adult rice weevils introduced into the test apparatus. Three types of the apparatus were negatively charged with different voltages (5-10 kV) under different RH conditions. Once the insects were introduced, electrons moved instantaneously from the CN to the EN and were grounded through the insect in the voltage ranges of 6-10 kV in the Ltype and 8-10 kV in the M-types and 9-10 kV in the S-type. This electron movement was simultaneously recorded as a transient electric current of the same multitude by two galvanometers. Table 1: Magnitude of the transient electric current mediated by adult rice weevils introduced. Twenty adult insects were used for each voltage/RH combination. Means and standard deviations were calculated from five replicates. Letters (a-c) indicate significant differences within each column (p<0.05) according to Tukey’s method. However, the magnitude of the electric current was conspicuously different among the types used, even when the same voltage was applied. These results indicate that different amounts of electricity (free electrons) accumulated on the CN and were released toward the insect. The magnitude of the increase in current corresponded to increases in CN area (i.e., increases in the electrical capacitance of the CN). In all types, the magnitude of the current became larger as the applied voltage increased. The RH conditions did not cause any significant difference in the insect-mediated transient electric current in all types. Table 2 shows the rates of mortality and dismemberment of rice weevils introduced in to the apparatus. The lowest voltage that could kill all insects by an electric shock was 9 kV in the L-type and 10 kV in the M and S-type. These voltages generated similar levels (approximately 25 μA) of insect-mediated transient electric current, indicating that this level of electric current was necessary to effectively electrocute insects in the electric field (Table 1). Table 2: Death and dismemberment of adult rice weevils introduced into the electric field of three types of the electrostatic apparatus under different relative humidity (RH) conditions. Higher currents generated a larger impact, violently knocking insects toward the lower exit. The magnitude of the transient current and the impact on the insect increased with the applied voltage. The increased impact to the insects was evident from the increase in the number of dismembered insects (Table 2). At lower voltages, the electric shock was insufficient to kill the insects because there was less accumulation of free electrons on the CN. These results met our expectations, indicating the applicability of this method for direct eradication of insect pests. In the next experiment, we introduced rice grains into the electric field of the apparatus and confirmed that no electric current was generated. Although we did not measure the volume or surface resistivity of rice grains in the present study, our results suggest that rice grains are highly insulative, such that insects mixed with rice grains would be selectively impacted by electrons due to their higher conductivity. We then conducted an insect eradication assay using a mixture of rice grains and adult rice weevils. In this mixture, the insects were selectively impacted by electrons; in fact, the detector recorded the same number of transient electric currents as insects introduced (data not shown). Eventually, all insects were killed, regardless of their density within the rice grains. These results were exactly the same as those from the above experiment, indicating that the selective electron movement targeting the insect was not disturbed by the presence of rice grains in the samples. Based on these results, we were able to apply our method to the eradication of rice weevils nesting in bagged rice (20 kg) for commercial use, which had been rejected on a regular inspection for contamination by insect pests. In this approach, we used the L-type apparatus (charged with 9 kV) to enhance our ability to treat rice grains. All rice grains in each bag were treated within a short time (10-11 min), and all insects were crushed without leaving any trace. Judging from these results, we propose the most effective application of the present system; this method could be integrated into the line between the rice polishing and packaging processes for the preparation of pest-free bagged rice. Theoretically, the present method is applicable to all insect pests that possess a conductive cuticle layer; during the preliminary assay, we confirmed successful application to the control of stored product pests, such as the cigarette beetle (Lasioderma serricorne), red flour beetle (Tribolium castaneum), and Azuki bean weevil (Callosobruchus chinensis). Electric power consumption by the screen was low during its practical use. The device had a simple structure consisting of three components: one CN, two ENs, and a voltage generator. The voltage generator was a booster to raise the voltage (from 1 to 10 kV in this case) and charge the CN. The negative charge accumulating on the CN created an electric field to polarize the ENs, an electrostatic phenomenon described as the electrostatic induction of a conductor placed in an electric field . The only component needing an electric power supply was the voltage generator, and its electric power was only 5 watts, equivalent to a small electric bulb. The present work demonstrated an effective application of basic electrostatics for controlling insect pests in stored rice grain. The proposed electrostatic apparatus is a unique product, newly developed for this purpose. The structure of the apparatus is simple, and no special techniques are required for its construction. The apparatus can operate at low electric power consumption to effectively kill insect pests capable of causing severe crop damage. The present study demonstrates that the method can be applied for efficient pest control in stored crops, removing the need for insecticidal treatments. This work was supported by JSPS KAKENHI Grant Number 16K00803. Hill DS. Pests of stored products and their control. 1990; Belhaven Press, London, 11;1-274. Matsuda Y, Nonomura T, Kakutani K, et al. A newly devised electric field screen for avoidance and capture of cigarette beetles and vinegar flies. Crop Protection. 2011;30(2):155-62. Matsuda Y, Ikeda H, Moriura N, et al. A new spore precipitator with polarized dielectric insulators for physical control of tomato powdery mildew. Phytopathology. 2006;96(9):967-74. Matsuda Y, Kakutani K, Nonomura T, et al. An oppositely charged insect exclusion screen with gap-free multiple electric fields. J Appl Phys. 2012;112(11):116103. Kakutani K, Matsuda Y, Haneda K, et al. Insects are electrified in an electric field by deprivation of their negative charge. Ann Appl Biol. 2012;160(3):250-9. Nonomura T, Matsuda Y, Kakutani K, et al. Electrostatic measurement of dischargeable electricity and bioelectric potentials produced by muscular movements in flies. J Electrostatics. 2014;72(1):1-5. Takikawa Y, Matsuda Y, Kakutani K, et al. Electrostatic insect sweeper for eliminating whiteflies colonizing host plants; a complementary pest control device in an electric field screen-guarded greenhouse. Insects. 2015;6(2):442-54. Matsuda Y, Nonomura T, Kakutani K, et al. Avoidance of an electric field by insects: Fundamental biological phenomenon for an electrostatic pest-exclusion strategy. J Phys. 2015;646(1):0120031-4. Nonomura T, Matsuda Y, Kakutani K, et al. An electric field strongly deters whiteflies from entering window-open greenhouses in an electrostatic insect exclusion 1 strategy. Eur J Plant Pathol. 2012;134(4):661-70. Shimizu K, Matsuda Y, Nonomura T, et al. Dual protection of hydroponic tomatoes from rhizosphere pathogens Ralstonia solanacearum and Fusarium oxysporum f. sp. radicis-lycopersici and airborne conidia of Oidium neolycopersici with an ozone-generative electrostatic spore precipitator. Plant Pathol. 2007;56(6):987-97. Nonomura T, Matsuda Y, Kakutani K, et al. Physical control of powdery mildew (Oidium eolycopersici) on tomato leaves by exposure to corona discharge. Can J Plant Pathol. 2008;30(4):517-24. 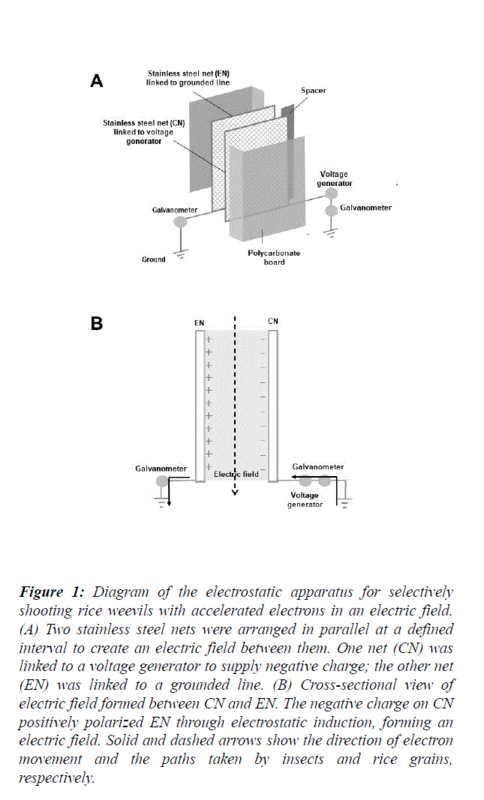 Jonassen N. Electrostatic effects and Abatement of static electricity. Electrostatics. Kluwer Academic Publishers, Massachusetts, 2012;75-120. Wegner HE. Electrical charging generators, McGraw-Hill Encyclopedia of Science and Technology (9thedn), The Lakeside Press, New York, 2002;42-43. Nishizawa K, Nojima H. Air purification effect of positively and negatively charged ions generated by discharge plasma at atmospheric pressure. Jpn J Appl Phys. 2001;40(2):835-7. Halliday D, Resnick R, Walker J. Electric fields. Fund Phys. Johnson S, Ford E (eds.) New York, John Wiley & Sons, 2005;580-604. Ishay JS, Shimony TB, Shalom AB, et al. Photovoltaic effects in the oriental hornet, Vespa orientalis. J Insect Physiol. 1992;38(1):37-48. McGonigle DG, Jackson CW. Effect of surface material on electrostatic charging of houseflies (Musca domestica L). Pest Manag Sci. 2002;58(4):374-80. McGonigle DG, Jackson CW, Davidson JL. Triboelectrification of houseflies (Musca domestica L.) walking on synthetic dielectric surfaces. J Electrostatics. 2002;54(2):167-77. Honna T, Akiyama Y, Morishima K. Demonstration of insect-based power generation using a piezoelectric fiber. Comp Biochem Physiol 14-Part B: Biochem Mol Biol. 2008;151(4):460. Kakutani K, Matsuda Y, Haneda K, et al. An electric field screen prevents captured insects from escaping by depriving bioelectricity generated through insect movements. J Electrostatics. 2012;70(2):207-11. Moussian B. Recent advances in understanding mechanisms of insect cuticle differentiation. Insect Biochem Insect Mol Biol 2010;40(5):363-75.